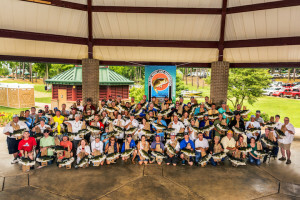 The Toledo Bend Lake Association awarded 81 lunker bass replicas to anglers at the Toledo Bend Sealy Outdoors Big Bass Splash at Cypress Bend Park on Sunday May 17, 2015. This is the third year in a row that the Toledo Bend Lunker Bass Program has yielded a record number of lunkers (58 in 2013 and 61 in 2014). The 10-lb. or larger bass were caught on Toledo Bend Lake from May 19, 2014, to May 15, 2015. Mrs. Dinah Medine, Coordinator of the TBLA Lunker Bass Program, presented the replicas to an impressive group of anglers on the final day of the Big Bass Splash Tournament. Among the 81 lunkers caught, 47 were in the 10-lb. class (weighing between 10.00 and 10.99 lbs. ); 28 in the 11-lb. class; and 6 meet the 12-lb. class with the largest weighing in at 12.81 lbs. Eight of the lunkers (11.92 – 12.81 lbs.) qualified for the Top 100 largest reported bass caught on the Bend, and the anglers were awarded a Top 100 hat and certificate by Mrs. Linda Curtis-Sparks, Director of The Sabine Parish Tourist Commission. Three fishermen—Daniel Schexnayder of Iowa, LA, George Herr of Many, LA, and David Vidrine of Ville Platte, LA—each caught and registered two lunkers this year. A majority of the lunkers were caught by LA and TX anglers; however, three were caught by anglers from Illinois, Iowa, and Tennessee. More information and photos of many of the lunkers can be viewed on the Facebook Toledo Bend Lunker Bass Program page, the Toledo Bend Lake Association’s website at www.toledobendlakeassociation.com, and the Sabine Tourist Commission website at www.toledobendlakecountry.com. All 81 fish registered through the Toledo Bend Lunker Bass Program were tagged and returned alive to the Lake to spawn and to be caught again, a major conservation goal of the Program. In fact, five of the fish caught this year had been caught before. The Lunker Bass Program is one of many beneficial projects sponsored by the Toledo Bend Lake Association which is dedicated to improving the quality of the Lake and the amenities surrounding it. Congratulations to all those who have earned over 650 lunker replicas throughout the years . . . let’s keep Toledo Bend booming with lunkers for next year’s awards!